I read books on a wide variety of topics. Here is a list of books I’ve read this year. My very short take is included at the end. A list of books I read last year. My very short take is included at the end. 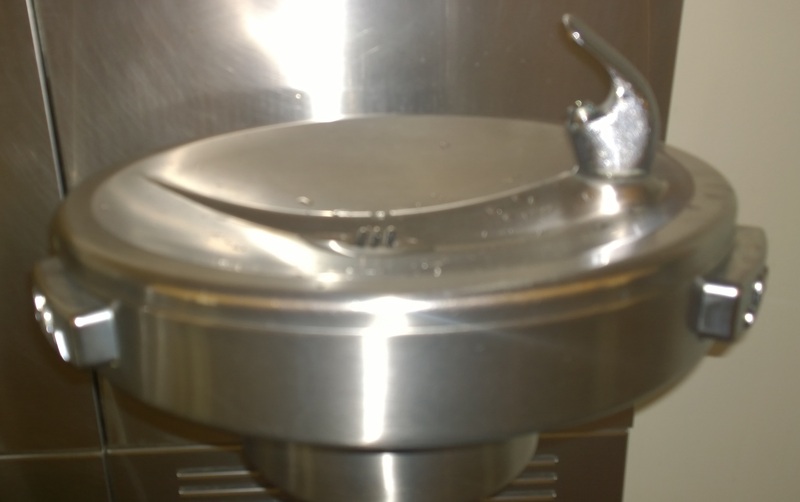 Drinking water fountains are visible everywhere – airports, restrooms, parks. It’s a great way to let thirsty people, adults and children alike, to drink water when they are not in the comfort of their homes. It’s also a great way to waste water. More water goes down the drain than a person’s mouth. In absence of a cup or a glass, there is no better design available that minimizes loss of water. A few months ago, I got off a flight at the Atlanta airport. I was thirsty and went straight to the first water fountain I saw. I first looked for a button to press or a knob to turn that would get me the water, just the way I’ve always done. When I couldn’t find it, the next second, I noticed a label that showed how to waive my hand under the fountain to activate the faucet. Oh, that’s helpful, I thought and was immediately impressed by the use of sensors in a water fountain. I waived my hand. Nothing happened. Waived again. And again. Nothing. A feeling of embarrassment clouded me, and I felt people looking at the idiot who couldn’t figure out how to waive a hand to activate the fountain. I quickly left and didn’t stop at the next fountain. Two days later, while returning, I was again at the same airport. I decided to try waving my hand at a different fountain. It worked, and I felt smart again. Use of sensors is a good idea. Nobody touches the button. No more passing of germs from one hand to another, at least through a water fountain. This might be the reason the designers decided to use sensors. The designers ignored a fundamental design principle and the scenario when the sensors are not working: feedback. There is no way someone would know if the sensors are not working. A mechanical fountain has a button that people have to press. 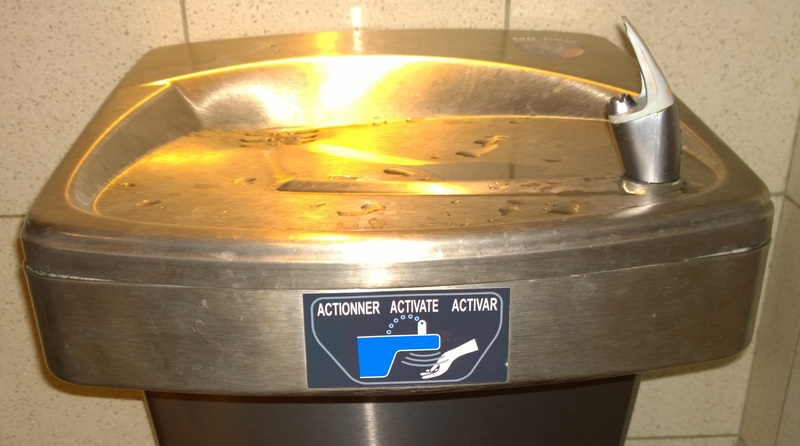 If they press the button and water doesn’t come out, that’s feedback enough indicating that the fountain is not working. What if my hands are not free, if I’m carrying something or a baby that I can’t put down? I can use, and have used, my body to press the button to drink water from a mechanical fountain but I can’t do it with this one. Finally, if you need to use an illustration to show how to use an item as simple as a water fountain, that is, in my book, a bad design. Yes, we won the Internet on February 26, 2015. But, first things first. For educated folks, The Oatmeal has explained net neutrality beautifully with an example. Simply put, net neutrality is all about information on the Internet being treated equally. Which means, a movie on Netflix or a video on YouTube has the same priority as any other video from a small startup. The cable companies like Comcast or Time Warner cannot charge money from any company to speed up their videos streaming and slow down feed from companies that do not pay. Everything was hunky-dory and information on the Internet was free. Free as in air, not free as in beer. And all information was considered equal. This was the default so we never paid – or had to pay – attention to concepts like “net neutrality”. Everyone received the same content on the Internet and all content from all companies was treated equally. Netflix started slowing down for Verizon and Comcast customers. Netflix, being the most popular online TV and movies provider, consumed about 25% of the total bandwidth of the Internet connection in 2012, which rose to 35% in 2014 during peak TV viewing hours. So, some service providers started asking Netflix to pay more for more bandwidth usage. 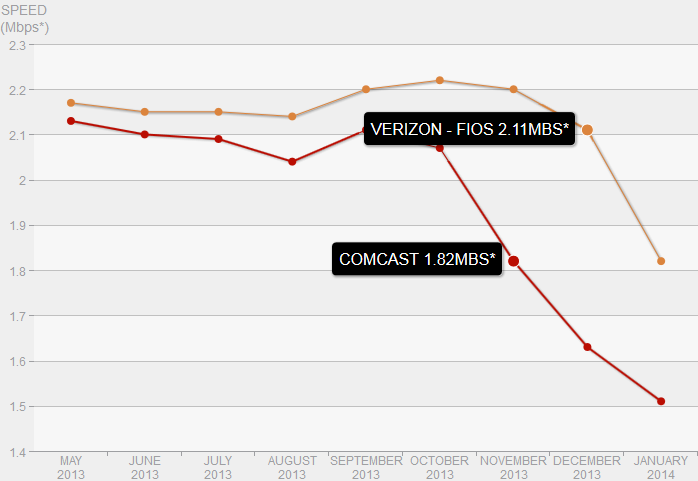 Netflix declined and these service providers started throttling Netflix. 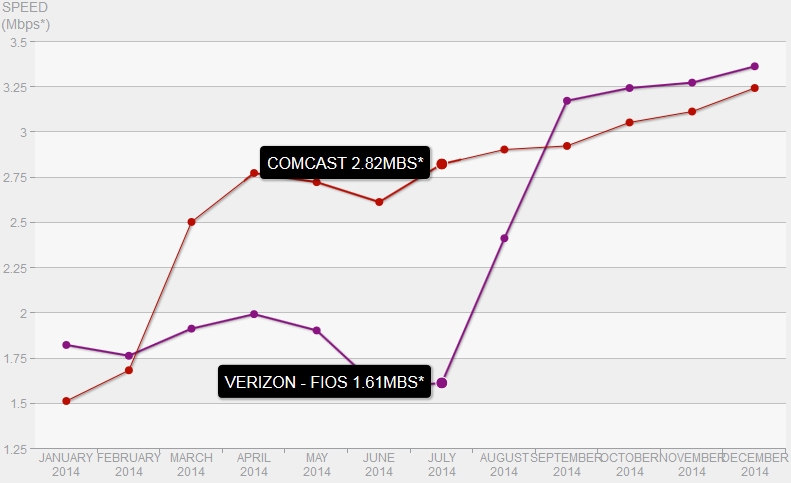 In February 2014, Netflix agreed to pay Comcast, and later to Verizon, to stream its videos at higher bandwidth. Then the streaming speed went up again. Federal Communications Commission is a US government agency that oversees and regulates all communications, including TV and radio airwaves and wire and cable transmissions. In 2005, the FCC had issued guidelines to promote net neutrality. These were not formal rules, so the ISPs were not legally bound to obey them. In 2011, Verizon sued FCC and asked the court to overturn the open Internet rules. The court ruled in favor of Verizon on the grounds that the Internet providers are not classified as common carriers and as such, FCC does not have authority to regulate them. In 1934, congress enacted the Communications Act to regulate the wire and radio communications. The Act was amended in 1996 into the Telecommunications Act and the Internet was included under its purview. The Act made a distinction between “telecommunications service” and “information service” wherein the telecommunications service are more stringently regulated than information service, which included the Internet service providers. The Act was intended to foster competition among the providers but due to consolidation in the industry, only a handful of providers remained operational in each region. Verizon won the lawsuit on the grounds that it was an information service provider and hence, cannot be regulated by FCC, which was the right decision. What is Title II of the Telecommunications Act? One of the seven titles of the Telecommunications Act, Title II outlines the provisions of “broadcast services”, which includes “Common Carriers”. Title II stipulates that common carriers can’t “make any unjust or unreasonable discrimination in charges, practices, classifications, regulations, facilities, or services.” In February, FCC voted in favor of reclassifying the ISPs as Common Carriers, which means the broadband Internet service will be treated as telecommunications service and not information service. President Obama has openly and strongly supported net neutrality. The final rules have not been announced; however, there has already been an outcry from the industry, which was expected. However, many leaders of the Republican party have strongly spoken against the rule change. Lawsuits would undoubtedly follow once the rules are announced, and it might take years before things are stable again. Until then, we, the people, have won the Internet. People: 1 – Douchebags: 0. Despite the occasional rants of random people criticizing teachers appearing in the media, I’m a huge believer in the noble profession of teaching. I believe that the presence, help, feedback, and expectations of a teacher is crucial to a student’s, particularly a school kid’s, performance – academically, athletically, and in other activities. The availability of a teacher, or a mentor, can be extremely valuable to people of all ages and in all disciplines of life. 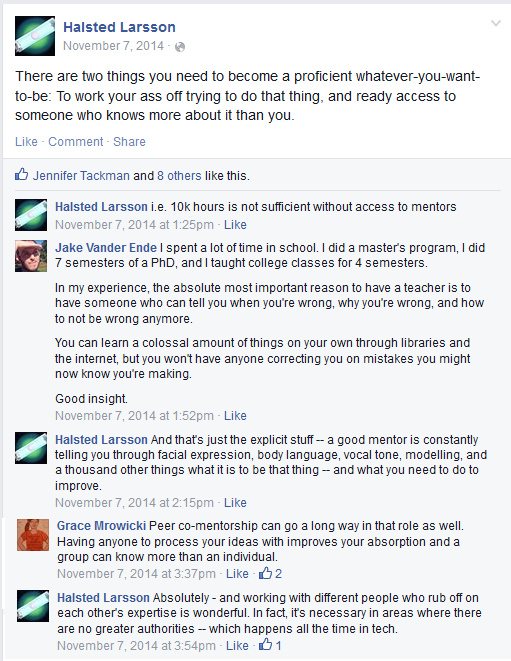 The exchange in the screenshot below happened on Facebook where one of my friends posted and a few other people responded with their comments. My beliefs exactly.